We here at Tasty Chicago always have a bias towards Chicago-based chains when venturing into the land of fast food. 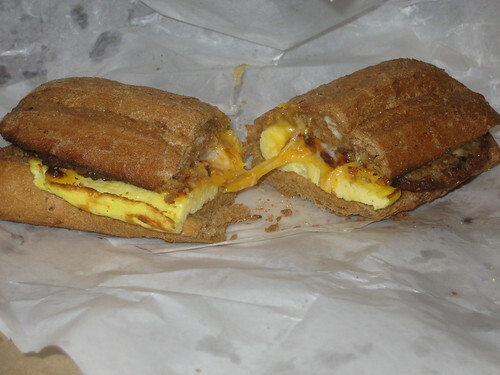 If I want a fast, hearty breakfast, nothing beats the sausage, egg, and cheese breakfast sandwich at Potbelly Sandwich Works. That’s right, many of the Potbelly restaurants have breaky (cool-speak for breakfast) and it’s a great thing. It’s also a huge thing. I would say about twice as big as the sausage and egg McMuffin from that other fine local chain, McDonalds. Potbelly puts it through the same exacting process that all of their sandwiches go through. The egg, cheese, and sausage patties (2) go on and it makes the famous trip through the Potbelly oven. The bun is that wonderful combo of crispy and soft and it’s a joy to eat. Ahh, I remember you Potbelly, my friend. You were just a little storefront on Lincoln (just south of Fullerton) when I moved here in 1989. You’ve come a long way baby and I feel like I grew up with you. You’re kind of like that good friend from third grade…that I used to hang out with until you got really popular and then made me wait in line just to say hi. Which is not necessarily a compliment, I might add. But I don’t hold it against you because you’re sandwiches are the unequivocal masters of the hot, gourmet sandwich world. Posted in food on 2007/04/24 by John.